Kathryn Ford knows one thing for sure; she will not marry the deceitful, arrogant man her father has arranged for her since the day she was born, simply as a pawn to enrich his vast holdings. When she discovers she's been disowned for her defiance, the pampered socialite takes her destiny in her own hands. 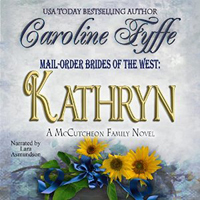 Determined to show her father what a capable a woman she is--without his help or interference--she signs up to be a mail-order bride, totally prepared to give up all the luxuries of her previous life. But once thrown into the rigors of a working farm, Kathryn fears she may have made the biggest mistake of her life--and finally met a challenge she can't conquer. Tobit Preece has a problem. His ailing grandpappy has one wish in the world—to bounce a great-grandchild on his knee before he passes on. The senior Preece has deeded his large farm to his grandson, and a grateful Tobit would like nothing better than to fulfill his wish. When Tobit misses out on his chance with Heather Sanford, a mail-order bride in Y Knot, Montana, who suddenly found herself without a groom, he thinks his chance to achieve his grandfather’s dream is dead. Then Heather’s new husband suggests Tobit send for his own mail-order bride. Or perhaps Heather already knows of a nice young woman personally? Determined to have a child before the spring calves romp in the pastures, Tobit sends for his own mail-order bride. Can two completely unsuitable people marrying for the wrong reasons end up on the right side of happiness? 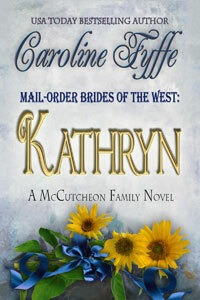 Find out in the next adventure of Mail-Order Brides of the West! Waiting outside Cocoa Confectionary, Kathryn Ford opened her reticule and peered at the train tickets nestled inside. She’d had the two-inch-long vouchers for three days, and each time she dared to look, her mouth dried to sand and her lungs constricted. Determined, she snapped her bag closed. Her intended had also sent enough money to purchase her stagecoach ticket once she reached Waterloo, and from there she’d travel on to Montana Territory. She squared her shoulders and lifted her chin. How difficult could it be to plant and harvest? She’d done her share of clipping the roses at home, and she’d even enjoyed it. Milking a cow couldn’t be that arduous, could it? Women had done that task since the beginning of time. Bertha Bucholtz hurried out of the chocolate shop, a small white bag in her hand. She met Kathryn where she’d left her, and the two young women started up the street, the commotion of the weekly market all around. Aromas—some good, some not—drifted on the air. A multitude of voices sounded as the merchants hailed to all who passed by their booths. Praise the cacophony. Praise anything to distract me. “They’re lovely,” Kathryn replied, making sure her voice didn’t wobble. “I wish I were able to bake like you. 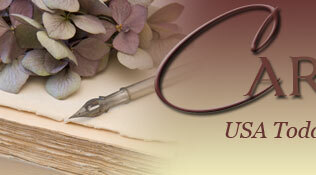 Piano and fencing aren’t exactly prime skills for a farmer’s wife.” She smiled prettily. “But I’ll make do.” I have to. Tobit Preece is waiting to claim me as his wife. She tamped down her panic. This mail-order bride business had started as a lark. A rebellious decision she knew would cut her domineering father to the quick. She remembered the sinking feeling when she’d received Tobit’s letters of interest, and her assurances to Mrs. Seymour when she accepted the match, that she could be a farmer’s wife. What if Tobit Preece turns out to be just like my father? Her mother had lived under a magnifying glass since the day she’d said “I do.” Franklin Munson Ford told his wife what to eat, think, and even what to wear. No matter what her mother did, it was always wrong. And from the time of Kathryn’s first memories, he’d been the same with her. Her sister, Poppy, was the lone exception to his overbearing ways. Their father doted on her every whim. Kathryn swallowed nervously, pushing away her thoughts of home, of coarse cowboys, and of the primitive town without a speck of culture called Y Knot. If her father hadn’t been so appalled when she’d announced her plan to become a mail-order bride, she might consider returning home to make amends instead of to say good-bye. But only if he would capitulate. I’m almost twenty and should be allowed to make my own decisions. Her father would never agree to that. She might as well bash her head against a stone wall. The only way to get back into his good graces would be to marry Oscar Scott—the man she’d been promised to since she was an infant. Marrying Oscar was no option at all! He was an egotistical boor, as well as domineering and a bit deceitful. If his unpleasant personality were the only obstacle, perhaps she would relent. But she’d grown up with Oscar, and considered him more a stepbrother than a suitor. She wanted a husband who moved the stars when he walked into the room. A man who was a partner, not a boss. Someone who loved her, and she, him. That man was not Oscar. But was that man Tobit Preece? Father’s disowned me. Cut me out of his will. The thought sliced her to the quick. I need this marriage now, more than I ever have, whether it’s a huge risk or not. The small amount of money I have left won’t last long. I’ve made my stand, and I have to go forward. She’d best not forget, either, that that fellow in Montana was expecting her in good faith. She’d given her word to him, and her pride and integrity were all she had left. “Kathryn?” Bertha tugged at her sleeve. “You’ve been in such deep thought all morning. I’m worried about you. Have you changed your mind about going?” Bertha, usually the cheeriest of the bunch of brides-to-be, gazed at her with troubled eyes, her full cheeks pink after their long walk from the red-and-white Victorian on Birmingham Street into the heart of St. Louis. Kathryn squeezed Bertha’s hand, dismayed at being the cause of her distress. The poor girl had been at the agency longer than she, and still hadn’t had even a whisper of a match. As much as her soft-spoken friend tried to hide her breaking heart, each day she became a little more withdrawn. “You know, pack my trunk…” She couldn’t think of one more “thing” to add. It had been a flimsy excuse. Kathryn halted in her tracks, berating herself for being so self-centered. She’d been blessed—again. Just like always, God had been good to her, and found her a husband in a town where her girlfriends lived. That alone should make her happy. If the others could be pioneer wives, so could she. In Kathryn’s mind’s eye, her sister’s unsympathetic face glimmered before her like a ghost. Poppy disapproved of her rejection of Oscar. The two of them had always been friends, and he was a much better person with her sister than he was with her. You deserve what you get for being so hardheaded toward him, Kathryn. Someday you’ll regret your temper and sassiness; mark my words, you will. Kathryn nodded, wondering what was keeping Darcy. Their bookish friend had split off from them an hour ago, heading to the library to pick up her reserved copy of Society and Solitude by Ralph Waldo Emerson. She’d promised to find them just as soon as she’d completed her task, but once in a library, Darcy could get lost for hours. Prudence Crawford had walked down to the market with them and was wandering around somewhere alone. Juniper, the housemaid, had also come along, but had waved them on when she stopped to admire a table filled with delicately made lace. In the old days, Kathryn would have bought the hardworking girl a bolt of the prettiest trimmings, but now she had to watch every penny she spent. She didn’t like the thought of leaving Bertha alone in the house with Prudence. Thank goodness Darcy hadn’t taken seriously Lina’s suggestion of a match with her neighbor, an anchorite named Gideon Walker in Sweetwater Springs. At least she’d still be in the house for a while to protect Bertha from unpleasant Pru. Kathryn wished she could get as excited over something as simple as lace. Her problems seemed to weigh down her shoulders like mountains, pushing all the joy from her heart. If only she could be like Juniper—alight with the possibilities of what she’d create with her bit of lace and a sewing needle. Imagine that! “It’ll be lovely,” Bertha said. The maid’s happiness was all Kathryn needed to recognize how complicated and painstaking her life had become. The fortune she’d lost. Her high standing in her community back home gone. The love of her family—no, her father—evaporated like a teardrop in the hot sun. Everything wiped out with one life-changing decision. What she needed was a life as modest as crocheted lace and sweet tea on a warm summer day. And now, like it or not, she’d have just that.